Sparta loved children and was the best dog he knew how to be. I killed Sparta today. 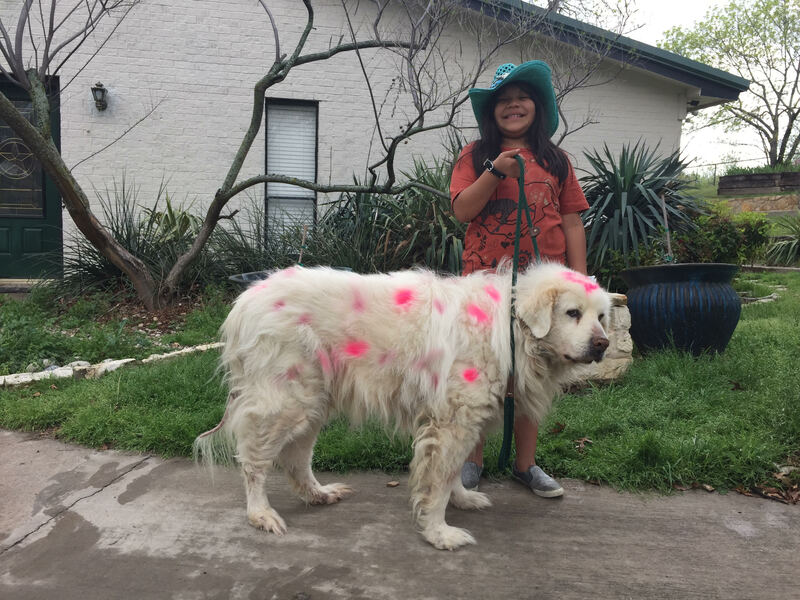 He was old, he’s been sick, and 140 pounds of Great Pyrenees creates all sorts of issues when it comes to elderly care. After two years with us (he was a rescue that somehow found his permanent way into our lives), he actually looked a LOT better than when I first succumbed to him. He was never “cute,” he didn’t like people, he hated other dogs, he sometimes guarded our own home against us. He was never a candidate for a “cute” ad. He stank, he had nasty oily hair, he farted, he bit, he barked randomly at all hours, he never grew hair on his back or tail (horrible staph infection and flea infestation when we got him), he thought that nail trims were a matter of life or death (his life, my death). He was, in his own Sparta-like way, a very happy dog during the two years he was with us. He loved children, chew bones, his bed in the cave that is my stepson’s room, and sometimes he even loved us. Chances are, we could have kept him around a lot longer. I’ve known many owners who do; some keep them for too long. But here’s a sad irony. As a breeder who spends a fair bit of time in the public eye, every dog I own seems to be a target for people who are anti-breeder. My hounds and I are held to a much higher standard than your neighbor with the 20 year old blind and deaf poodle. Because I’m a breeder, the dog who is just plain old and tired becomes “neglected and abused” in the eyes of those who are anti-breeder. Because I’m a breeder, the elderly dog with fatty tumors, male pattern baldness, and nails that drag the floor is a cause for headlines. Because I’m a breeder, no one stops to consider that the dog might be impossible to load in the car and considers biting the vet to be the highlight of his day. Because I’m a breeder, compassion is not available for me, or even considered to be a trait I might possess. Now, we know that’s not true, because we know me, right? As our beloved dogs age, it’s easy to see them as they were, rather than as they are. We see what we want to see, and believe what we want to believe. Any vet can tell you of the old dogs they see on a daily basis, their deplorable condition, and the difficulty their owners have making that final decision. Old animals are hard. They become increasingly frail, and there becomes a point where medical expenses exceed the budget for your next car – with no purpose or end in sight. When our neighbor chooses to let his old dog shuffle from day to day, not happy and whole but not at last prayers, we empathize with him. When a breeder undergoing inspection has several old dogs in the same condition, it’s “neglect” – we lose our compassion and somehow ascribe the existence of those dogs to greed. Realistically, nothing could be farther from the truth – it’s much less expensive to let old dogs go, than to spend the time and money to keep them on. I never argue about that last, best, most difficult choice we must all make for our dogs. Each of us has to come to terms with our choices, and nearly all of those make those choices out of love. Each of us has our opinion on when it’s “time,” but I believe we owe it to each other to support our friends as they make those choices, and not argue or criticize them – isn’t it hard enough as it is? Compassion. For the hounds, for each other, and for Sparta. He was the best dog he knew how to be.